Are Los Angeles Neighborhoods Less Segregated? Geographical analyses found that in the 2000s, L.A.’s total population living in super-segregated neighborhoods dropped from 40 percent to one-third. In the 1990s, L.A. became a poster child for racial segregation when riots following the acquittal of Rodney King’s killers brought attention to the city’s black-white divide. But since then, L.A. has come a long way, according to a new geographical analysis published in the journal Annals of the Association of American Geographers. Almost every other inhabitant lives in a neighborhood that has experienced significant shifts in the ethno-racial composition of its population during the last decade and a half. For their analysis, the researchers used a highly precise geo-computational software that examines the racial make-up of residents around a certain location. 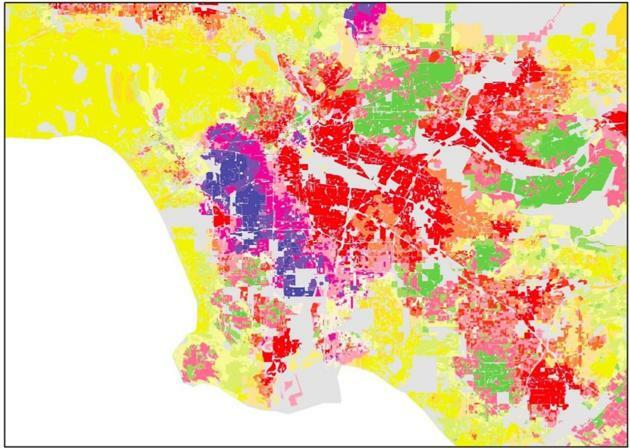 The tool then identified 20 neighborhood categories in L.A., ranging from “strongly homogenous” (those made up predominantly of black, white, Asian, or Hispanic residents) to “highly diverse” (which contained almost equal shares of all racial groups). This allows a more exact measurement of each individual’s geographical context, and it also allows a classification of neighborhoods that is based on not a single geographical scale but sensitive to shifts in the population composition of both an individual’s immediate neighbors as well as the ethno-racial mix of distant neighbors. The number of all-white and all-black neighborhoods have decreased in the decade analyzed, the researchers say. Back in 2000, 31 percent of the L.A.’s white residents lived in homogenous white neighborhoods, but by 2010 only 21 percent did. The share of L.A.’s black population living in all black neighborhoods has also declined from 15 percent in 2000 to 11 percent in 2010. In this period, more and more Hispanic and Asian residents moved into neighborhoods that were previously all-black, mixed, and even predominantly white. As a result, some previously homogenous neighborhoods have become less segregated, while others have now become predominantly Hispanic or predominantly Asian. Both Asian and Hispanic populations are growing and the strong preference to select neighborhoods that have similar populations is creating expanding homogeneous areas at the margin of concentrations of these groups. There are decreasing areas of homogeneous populations and a rapid increase in areas which are a mixture of all the racial and ethnic groups. Diversity and heterogeneity is the new structure of urban society.